Blessed are the lamb makers. 1. You need to compare self replacing female based enterprises and find what is profitable. Would it be a Wool by micron OR Dual Purpose sheep OR Meat sheep OR Cattle OR Goats. A “Mirror mirror on the wall …..” job. 2. Having you found the most profitable enterprise you need to allocate more acres to it. 3. It costs money to make money and so you should not cut costs until you have done 1 and 2 above. 4. You need to maximise the number of kilograms turned off whether it is wool, wool and meat or meat alone. If you did 1 & 2 correctly you are then able to indirectly influence price by choosing the right kg to turn off. 5. For example did you know that due to meat price rises following the sheep cull in 1992 all Merino producers are now underperforming Meat Producers and that wool has now become a by product of merino sheep? 6. That the introduction of polyoestic African sheep breeds in the late 90’s has made it possible for ewes to have at least 2 lambs per year? At a nominal $100/lamb a merino ewe has to grow 3 high priced fleeces, plus a surplus lamb sales a year to match them. 7. That the key to high sheep profits is high conception rates, not high wool cuts or high wool prices. 8. One of the extra costs associated with improved profits is better nutrition. It pays to feed profitable sheep. We can now explore the possibilities of moving sheep back onto grain country replacing crops with forages, onto irrigation maybe even sheds. 9. That flies and lice are no longer diseases of economic importance but infectious pathological diseases, Brucellosis, worms, dogs, footrot, and OJD are. 10. That the duration and timing of joining are of critical importance to profitability. 11. That lambs carried can be so numerous that we need to reconsider flock structures and casting ages downwards. Would you like an obligation free phone call? Would you like me to give you a plan to double your annual income free while restoring fertility in your soils? For cereal croppers I can offer a more secure income with similar or better incomes than grain using profitable high cash flow livestock enterprises suited to cropping soils. I’m happy to help you design a customized production plan for your property, identify your best markets , while you increase the store of Carbon, Hydrogen, Oxygen and Nitrogen in your soils. Your future wealth. This will turn your business from a price taking enterprise towards a price making enterprise, with inbuilt security for the next generation. I offer this service because I am a consultant specializing exclusively in helping Sheep and Lamb Producers secure more sales. I can also assist with your Bank Manager. You can then join my other clients (representing 50,000 ewes). With strength in growing sheep numbers we are working towards a marketing goal of weekly delivery of lambs, within specs, on time at a negotiated price, free of contaminants and residues. And if you find the plan I create for you valuable, you might want to become a client. If this is the case, my only fee is an annual retainer of $1/ewe with a minimum payment covering 2000 ewes. No commissions or hidden charges except possibly hospitality at your place. But before we go further, you need to know that I can’t help everyone, I can only be of benefit to producers who are prepared to do things on time according to our agreed plan. People who..
• Are sufficiently funded to eliminate predators, buy genetics, feed sheep, control economically important diseases and rebuild infrastructure (in about that order), so it won’t happen overnight…but it will happen. • Are sufficiently skilled in sheep husbandry or at least willing to learn. All the steps and procedures have been laid out for you. • Have a minimum of 500 ewes. Here’s what you do next: Schedule a no obligation planning session with me by simply filling in the form and clicking the link below. You’ll see a form with a few questions about your business and what you’re looking to accomplish. Once I have that information, I’ll give you an obligation free phone call. How do I manage debt serviceability? How do I compare Properties? Lloyd Dunlop Lamb Consultant, Goondiwindi. Did you see the latest National Dorper Annual? I thought it was very good and informative. Lloyd was an excellent sheep extension officer who I had the pleasure to manage while based at Toowoomba, DPI. He worked independently but was also a good team player when needed. He excelled in providing advice to sheep producers interested in prime lamb production. He also provide local leadership at the Goondiwindi DPI office and in the district. March 17, 2013, SANDRA managed Lloyd at Lloyd Dunlop Sheep and Lamb Consultant. Results of our last scanning of 6000 ewes & sales…. All undetectable ewes have been sold. 2000 Ewe lambs joined at approximately 7 months of age; 70% scanned pregnant. The 30% undetectable were sold to meatworks as lambs, 2/3 dressed at 27.1 kg at 10 months & the second draft at 23.6 kg at 12 months. The ewe hoggets (on their second conception) scanned 90% in lamb; 51% of those pregnant are carrying twins. If we can regularly repeat this, I believe that dorpers have a big future. Addendum: Jeff has achieved close to 200% lambings of scanned in lamb ewes for over 4 years now. That’s nearly 12000 lambs annually from twice joined 6000 White Dorper ewes. That’s 280% per year and not / not kidding. My ewes lamb every 6mnde and others 8mnde. Yes, most of the sheep runs all year on the pastures with the sheep that extra supplement for milk production and get the lambs get creep out. 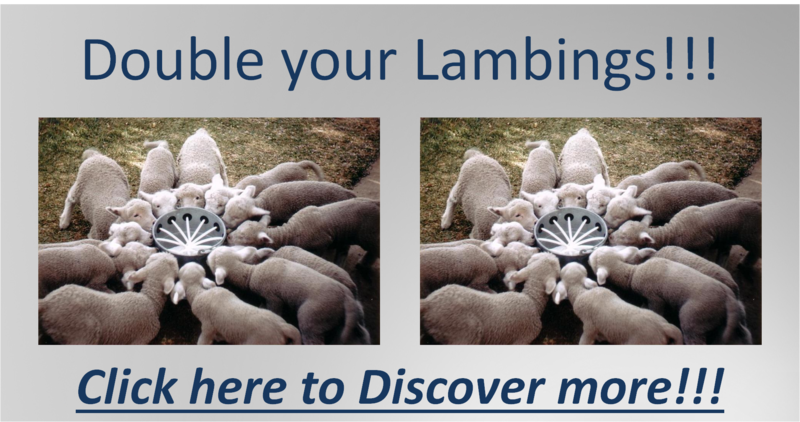 No I seleteer not 2linge (twins) on the stage, but my lamb% per lambing season on my older ewe is 170% avg. Translation from Affrikaans by Justice Malanot Boemie Saaiman says: 1) the 280% is per annum en not per lambing season Lloyd Dunlop. 2) some of his ewes lamb every 6 months and others every 8 months.3) the ewes are on Alfalfa most of the year with some supplements for increased milk production. 4) the lambs also get supplemental feed. Boemie doesnt select for twins at this stage. Some of his older ewes drop down to 170% lambing average.